"Combine Jose Cuervo Tradicional tequila with the flavors of cranberry, lime, and ginger ale for a fresh tasting cocktail. " Mix all ingredients in a highball or rocks glass. Eh. This was okay. Different. 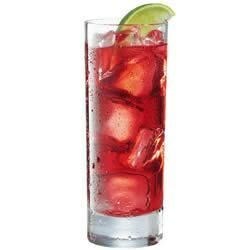 My variation leaves out the lime and uses 3 oz. of ginger ale in a tea glass. Yum!